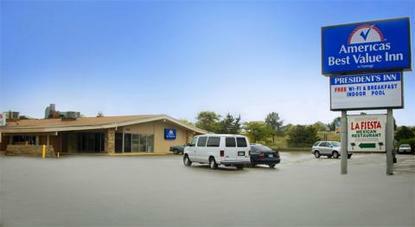 The Americas Best Value Inn is centrally located in Abilene, Kansas. Abilene is one of the most historic communities in the nation. Abilene was the boyhood home of our country*s 34th President, Dwight D. Eisenhower. Our facility offers 64 spacious guest rooms. We have a bar, lounge, and a family restaurant right on the premises. We offer Complimentary Continental Breakfast daily. We are close to many fine restaurants, businesses, and national landmarks. All our guest rooms are furnished with high-speed Internet access, coffeemaker, cable TV with HBO, and complimentary local calls. We also have a heated indoor pool and spa, and a large courtyard. We have fax and copy machines. Our front desk is staffed 24 hours. We are confident you will find your stay with us a very memorable and enjoyable experience. .